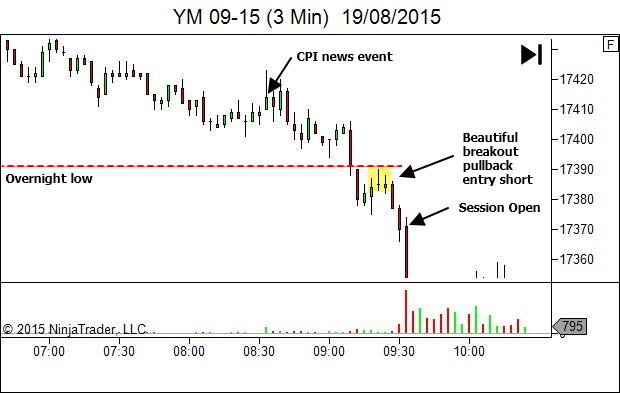 I love getting feedback from people experiencing success with the YTC Price Action Trader method. Last night was a little tough but still positive…. but tonight I have just got a 50 ticker!! It’s been a little goal of mine for a while.. These 30m S/R levels are freakin awesome.. your simple approach to market analysis is great. Previous education covered so many S/R options and possibilities it wasn’t funny… scratched part 1 at +1 as it just wasn’t moving as quick as I wanted. And on that note I’ll go to bed with an awesome trade. While it's great to see people experience some success, even in the early days of their growth and development, there are two other reasons I absolutely love this sequence. 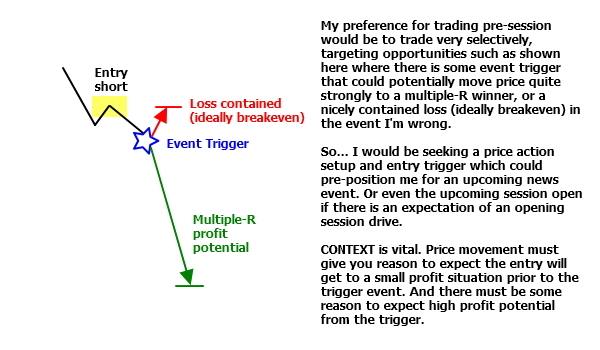 (1) It gives us the opportunity to review the trade and discuss my thoughts about trading before the regular pit session hours (that's when this trade occurred). (2) It ties in beautifully with the idea I was planning on sharing this week in Motivation Hacks #2. 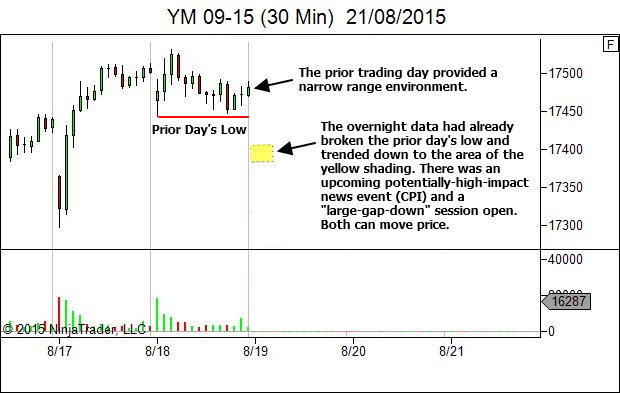 For now, let's review the trade and discuss trading in the pre-session market. 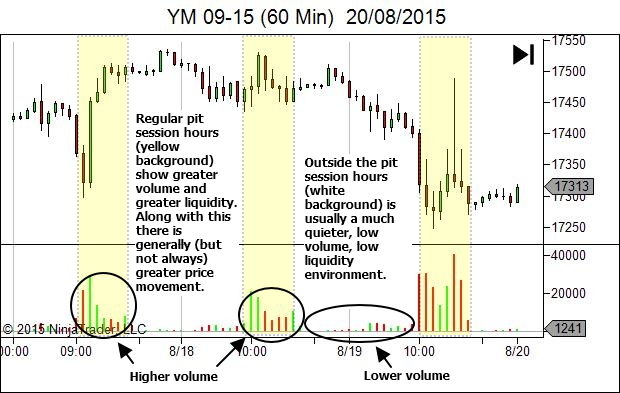 For those not familiar with the futures environment, you'll notice on the following 60 minute chart that it comprises periods of clearly defined regular trading hours (RTH), which are essentially the pit-session hours. Trading occurs outside this time as well, via the extended / electronic trading hours (ETH). Note how the volume is significantly lower during this time period. Now, there is ABSOLUTELY no problem with trading pre-session, provided one is aware of the lower volume, lower liquidity and usually lower volatility. And alongside that awareness you adjust to your trading to allow for this type of environment. My own preference is to just avoid the pre-session hours. In the past I have tended to not perform too well pre-session, averaging about breakeven, due to a tendency to target too many marginal opportunities. However some people appear to trade quite well within this environment. Each to their own, I guess. Part of "becoming a trader" is finding the right niche for your personality and style of trading; finding that place where you can best see and exploit opportunity. Now, I don't know if that's Nathan's plan or not. But the fact remains that he has followed that idea perfectly. Let's look at the trade from this perspective. First, we'll look at the higher timeframe chart to get some context… and then follow that with a trading timeframe chart looking at the trade entry area. For the higher timeframe chart, let me show you the regular pit session hours to give you an idea of how far price had dropped overnight. I've got no problems with the entry attempts prior to the CPI news event. If price had driven strongly in a with-trend direction they would have profited quite nicely. And if not, the loss was contained. But for me the real gem was the 50 tick entry. A strong overnight fall from a narrow-range topping session. A "potentially high impact" news event which probed higher but failed, driving price further down to new overnight lows. The break to new overnight lows setting up a beautiful breakout pullback entry opportunity, allowing entry to pre-position into a trade which has sufficient time and potential to move to some minor profits before the session open. And a session open that has a high potential for a strong-bearish "gap down open" momentum drive. It doesn't get much better than this. 4 ticks risk. 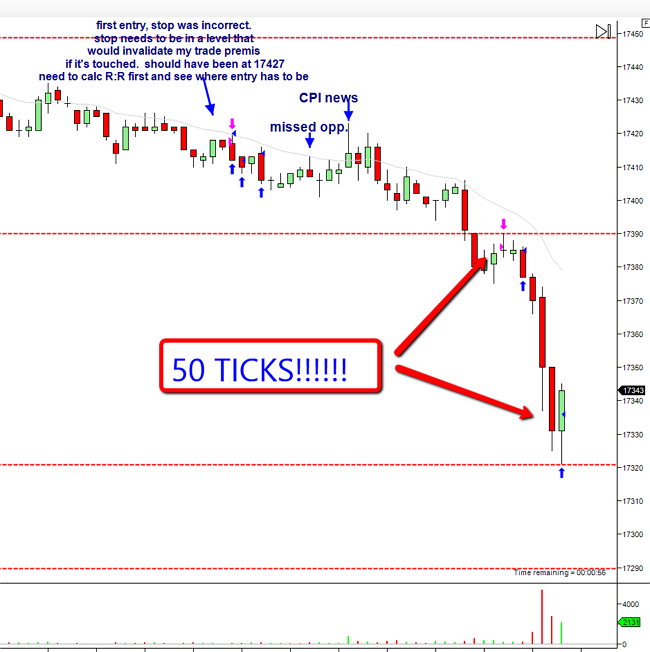 50 ticks profit. Nice work Nathan! Keep it up. Agreed, nice trade and great article.